I've encountered all sorts of edible goodies that contain "perfume" ingredients of one sort or another. Fruit and spice flavors abound in all manner of cooking; jasmine, violet, lavender, orange blossom and rose scent syrups, ice creams, cakes, puddings and custards. I've enjoyed vetiver-flavored soda in Thailand, and I recently came across a shortbread recipe that calls for frankincense. Quartier Latin reminds me of an exotic, wood-flavored macaron; it has a sweet character and is a "dessert" you can indulge in all day. Quartier Latin's macaron consists of a top layer gently scented with citrus-y cedar and a bottom layer flavored with coconut-y sandalwood...both layers contain sweet vanillic tonka bean. Between Quartier Latin's melt-in-your-mouth macaron layers there's a fresher-tasting gelée filling flavored with tongue-numbing cloves and lemon peel. The Quartier Latin macaron is topped with a milder clove and more intense tonka bean glaze (this would be your "aftertaste" or base notes). All Quartier Latin's ingredients smell great (and expensive). Though the sandalwood-cedar notes seem on the sheer side, they are tenacious: they mingle, separate, fuse and then diffuse for hours. I got raves on Quartier Latin 12 hours after I applied just four sprays of the perfume. If you love sandalwood and cedar, try it. 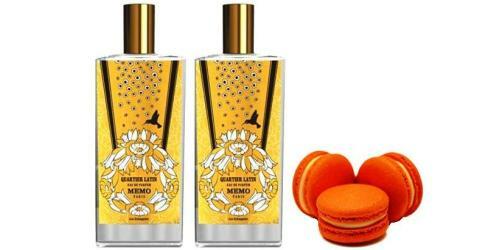 Memo Quartier Latin was developed by perfumer Aliénor Massenet. It is available in 75 ml Eau de Parfum, $210; for buying information, see the listing for Memo under Perfume Houses. 1. Other listed notes: clove, cedar, tonka bean, amber accord. Note: top right image of macarons via Wikimedia Commons. Not much of a cedar gal so I think I’ll skip this one, even though you make it sound so delcious. But I am curious about sandalwood and would like to try something with real sandalwood in it to because I really have no idea what it smells like . Do you have any suggestions on what to try? I have some sandalwood shavings from the Dubai souk and Serge Lutens Santal Majuscule smells just like them, along with a big crimson rose. Beautiful and a little raw, I highly recommend you try it if you have a chance. Thanks for the tip! I have a particular hate for rose so that might spoil my impression of Santal Majuscule, but it’s good to know that the sandalwood in it is true to nature! Real sandalwood is one of the reasons I collect vintage perfume. Also, La Via del Profumo sells Mysore sandalwood as a perfume ingredient at 120 Euros per grain. Oh, this sounds like a dream. I really liked Memo’s African Leather, so I’ll have to give this one a whirl. Not that I could afford a bottle… And I’m with you — I’ll take any real sandalwood I can get, and then wallow in it! Isabella…Memo has a good line-up. LaDomna…Etro Sandalo is the sandalwood perfume I buy over and over…I like Tom Ford Santal Blush, too. There are some good faux sandalwoods in perfumes as well. Cedar or no…I still think you should try Quartier Latin for the sandalwood note…it is stronger than the cedar. Thank you! I have tried a lot of different perfumes with “sandalwood” as a note but have been decidedly underwhelmed but also unsure if I’m smelling the real thing or not. I love my decant of Sandalo. I also have a bit of the older version of C&E Sandalwood, which is much lighter and sheerer, but the same essential quality. The NST buddy who swapped it to me assures me that plenty of the vintage stuff is still out there on ebay etc. jjlook: yes…finding a vintage perfume with loads of sandalwood is one way to sample the good stuff. I always quite liked TF santal blush but never loved it, then last week someone at TF let me borrow their guide to what TF private blends they recommend as the best combinations for layerering with each other and I’ve had fun playing since. So far santal blush layered with jasmin rouge is great and santal layered with Tuscan leather or tobacco Vanille are close runners up ! nathan: hmmmm…I’ll have to try a few of those combos. My Indian friends think Santal Blush is “too much”…on some days it can “tire” me! HA! You’ve piqued my curiosity NathanThomas. I have samples of both, so I’m going for it! In fact, I think I’m going to try it right now! They recommend 1 spray of the more intense fragrance (tobacco/Tuscan/jasmin), to 2 sprays of the blender ( in this case the santal). I always found the santal had a sour edge on me and the jasmine was too sweet and feminine but when combined the worst elements of each on me cancelled each other out and brought some harmony! There are some weird and wonderful combinations they recommend like white suede with cafe rose, or neroli Portofino with oud wood- combos I would never have come up with ! I own Quartier Latin. It is mostly sandalwood on me with not much cedar. I bought it blind and was not disappointed. cazaubon: glad that “gamble” paid off for you. Usually your taste is so different from mine that as much as I love your reviews, you usually don’t create any lemmings – that’s a GOOD thing! It’s nice to read a reviewer here who doesn’t add to my “to try” list! But you did it today. This sounds wonderful; I’m a huge sandalwood fan! Thank you for reviewing. Mysore sandalwood is popping up, expensively, here and there lately. I guess it’s too expensive and rare for companies to use. They should be able to use Santalum Album oil grown outside of Mysore though. I haven’t smelled them side by side but the oil I have from Pacific Island smells just like Mysore to me. Australian sandalwood is a different species completely and can’t compare. You have to bolster some aspects and cover up more to get a somewhat true sandalwood feel from it. Hi Kevin-you reviewed some Fieles recently. Their new Santalum is very nice. Donnie…ah, must try that one.